Standard - $66.99 Only 8 left! Santa is truly one-of-a-kind in his generosity and selflessness. Because if we had access to a bunch of flying reindeer, we’d be doing exactly what you see pictured here: trotting across the globe on the back of our magical red-nosed steed! We’d hit all the hotspots: a drive-in movie, a refreshing juice bar, and an arcade or casino (if we were feeling lucky). We’d deliver pizzas for free, just to see the look on people’s faces when they answered the door! We’d see every continent, greeting cheering crowds in every major city—and we could probably make it back to the North Pole in time for dinner. If that sounds as good to you as it does to us, you might be interested in this hilarious Ride A Reindeer Costume. Sure, there are other outfits that let you dress up as Santa. There are even a few that will bring out your inner sled-deer. But how many costumes will let you be the guy holding the reins and the remarkable owner of that bright shiny nose? The only thing better than the magical illusion of this multi-part look is the simplicity of its design! 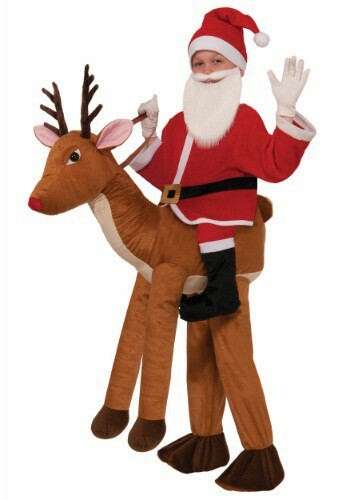 Rudolph and the rider’s legs are one continuous piece, worn like a pair of pants and filled out with stuffing. That means the only other parts you need to put on are the velour jacket and hat! Don’t forget to add a beard for the full effect. And please bring a snack for your traveling companion. Flying takes a lot of energy!